As part of ongoing research on the chemical composition and the antimicrobial properties of Burkinabe plants essential oils alone and in combination, essential oils (EOs) from leaves of Cymbopogon citratus and Cymbopogon giganteus from Burkina Faso were analyzed by GC–FID and GC–MS. Five constituents, which accounted for 96.3% of the oil, were identified in the EO of C. citratus. Geranial (48.1%), neral (34.6%) and myrcene (11.0%) were the major constituents. For C. giganteus a total of eight compounds were identified which represented 86.0% of the oils extracted. The dominant compounds were limonene (42%) and a set of monoterpene alcohols: trans-p-mentha-1(7),8-dien-2-ol (14.2%), cis-p-mentha-1(7),8-dien-2-ol (12%), trans-p-mentha-2,8-dien-1-ol (5.6%) and cis-p-mentha-2,8-dien-1-ol (5.2%). The EOs were tested against nine bacteria by using disc diffusion and microdilution methods. C. giganteus EO showed antimicrobial effects against all microorganisms tested whereas C. citratus EO failed to inhibit Pseudomonas aeruginosa. The antimicrobial activity of combinations of the two EOs was quantified by the checkerboard method. Combinations of the two EOs exerted synergistic, additive and indifferent antimicrobial effects. 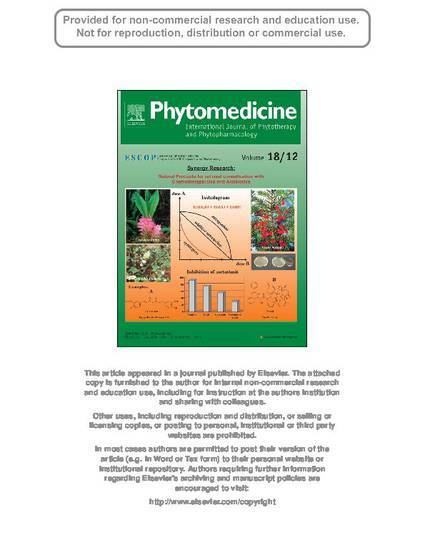 Results of the present investigation provide evidence that the combinations of plant EOs could be assessed for synergistic activity in order to reduce their minimum effective dose. © 2011 Elsevier GmbH. All rights reserved.